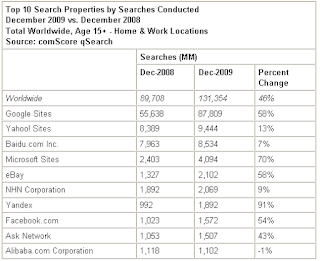 Some interesting findings from comSCore as they released a study on growth in the global search market in 2009. Jack Flanagan, comScore executive vice president suggests “Search is clearly becoming a more ubiquitous behavior among Internet users that drives navigation not only directly from search engines but also within sites and across networks. If you equate the advancement of search with the ability of humans to cultivate information, then the world is rapidly becoming a more knowledgeable ecosystem.”. 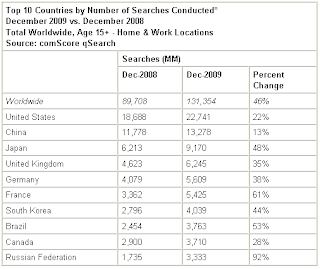 Russia, France and Brazil saw the greatest increases based on the number of searches conducted in those countries. In terms of Search enginess, Russian search engine Yandex experienced the greatest increase in terms of searches icreasing by 91% based on the comScore data.